Receive the best ski tuition exclusively from BASI Trainers who are the best in the business and will get your skiing where you want it to be. 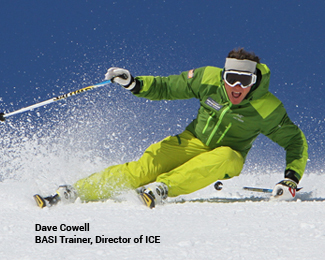 The ICE Masterclass course is an amazing opportunity to transform your skiing. You will be coached by our small, select team of trainers Mark Jones, Rupert Tildesley, Rupert Goldring and Dave Cowell. All of these guys have hit the highest levels of pro coaching, they are all trainers for BASI, which means that their full time roles are to train and assess ski instructors. They have also all represented Great Britain in the BASI demo team, and have travelled worldwide demonstrating the highest level of skiing while delivering workshops to other alpine nations. They will be totally focused to move you up to the next level in one week! The Masterclass comprises fantastic coaching for 5 half days or 5 full days, depending on the course offered, allowing you to practice new found skills discovered within the session. Tuition will take place across a range of terrain, including piste, bumps, variable snow and steeper slopes, with technical input to further your performance in all of these areas. There will be comprehensive video debriefs, with all the coaches using the very latest digital technology to analyse your progress and give you clearly defined goals for the following day. At the end of the course you will have a clear action plan on how to develop your skiing in all areas, which will help you achieve your long term goals. 5 half-days or full-days of quality training. Coaching from a BASI Trainer. There is no specific entry criteria and because we run multiple groups, you can join at almost any level. However, it is recommended that you can ski comfortably on most pistes and are looking to further your technical skills rather than learning to ski during the early stages. If you are looking to learn to ski from a lower level, you may want to consider getting some private tuition from one of our trainers.